Lately, whenever I can steal a few moments to read uninterrupted, I’ve been diving into Patrice Nganang’s Mount Pleasant, as translated by Amy Baram Reid. It’s a fantastic novel, set in colonial-era Cameroon, but with an early 21st-century frame that allows for an imaginative reinvention of the past, playful without ever losing its darker edges. As Reid notes, there’s a lot going on in this book for one translator to take on, but I’m delighted by how she’s pulled it off so far, and eager to take the rest of the journey with her. One of the phrases I remember from childhood—and maybe you do to—is “little pitchers have big ears.” It amused me then because of the incongruity of the image (a pitcher with ears?) and also for its truth: kids soak up what they hear, even if the words aren’t meant for them. It also describes the narrative premise of Patrice Nganang’s Mount Pleasant: for if one kid hadn’t been a sponge for all she had overheard, the stories of Mount Pleasant would have been lost forever. At the heart of Mount Pleasant are the intertwined issues of conversation and translation: conversations in the present between the elderly Sara and the young Bertha, themselves translations of exchanges years before between another Bertha and the same Sara, a young girl who was transformed by stories into a young boy, Nebu. Conversations and stories swirl magically in the court of the Sultan Njoya and, years later, resurface to enchant both the idle youth of Yaoundé and the novel’s readers. Artists discuss aesthetic ideals and lovers their amorous exploits; ambitious plots are revealed and scars disclose traumas born in silence. Exchanges in the novel take place in multiple languages, and often on the borders between French, English, and German, between Shümum, Shüpamum, and Ewondo. Writing, drawing, and sculpture become the sites where tales and visions are translated—allowed to travel across time and space, as well as language. This concatenation of words and languages made my experience of translating Nganang’s novel exceptionally challenging and rewarding. 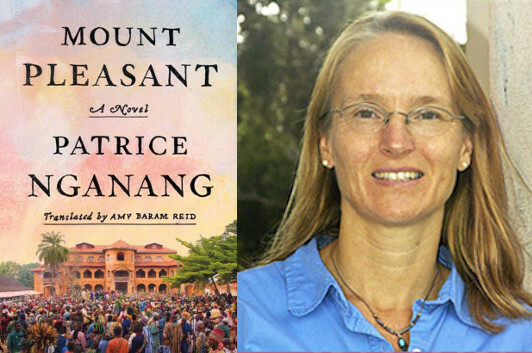 Although the French original, Mont Plaisant was published in 2011, my listening in on the novel’s conversations goes back to 2007, when Patrice gave a talk on Njoya’s library at the college where I teach. That night Patrice transported the audience to Cameroon, first to Yaoundé—where he was raised and where the library now stands—and then to Foumban—the capital of Njoya’s sultanate at the turn of the twentieth century. He shared with us the story of his discovery of the vibrant artistic community that surrounded the sultan, of the books and manuscripts that were produced there in the years before Cameroon was divvied up by the League of Nations, and of the silencing of this literary heritage in the years since the colonial encounter. As Njoya’s court comes to life again in the exchange of stories between Sara and Bertha, Nganang reminds his readers that we have a responsibility to listen past the silences that surround us, to hear and learn stories that were written out of the record. I’ll admit I embarked on this translation with trepidation: Mount Pleasant is a big novel in terms of scope and length. It ranges geographically from Foumban and Yaoundé to Berlin, and temporally, between the 1880s and 1933 and its narrative structure is complex. The novel is not only polyphonic—ceding the floor to scores of story-tellers—but also ventriloquial—drawing our attention to when and how people speak for others. Mount Pleasant takes us into a world of words we cannot master—words spoken in languages unfamiliar to most Americans, words written in scripts long forgotten. Some of these scripts adorn the section headings in the novel, while others let us measure what remains unsaid in Sara’s story. There were times in the process of translation when I felt like a juggler with too many balls in the air and too few hands to catch them. But when the last word was said, the interweaving of the novel’s many plots and timelines left me in awe of Nganang’s talent as a storyteller: how he is able to interweave magic and brutal realism, coincidence and conspiracy, in a story that is at once satisfying and inexhaustible. A story worth lending an ear.